OK, I have a couple of boxes of books now, and so you can get signed and personally dedicated copies direct from me here. 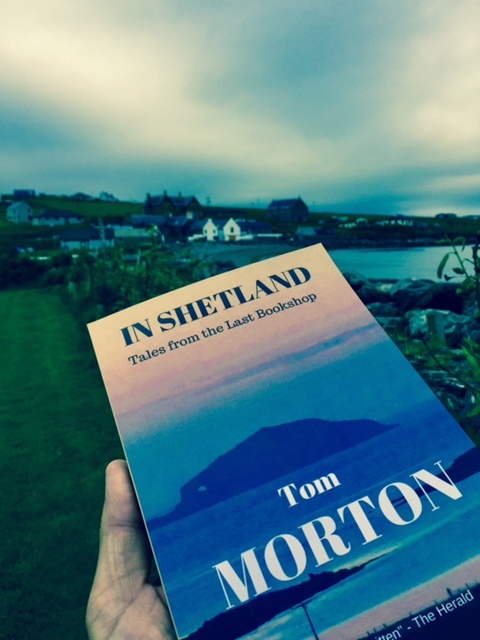 The Shetland Times Bookshop in Lerwick has signed copies too. Otherwise, here's how to get the book. 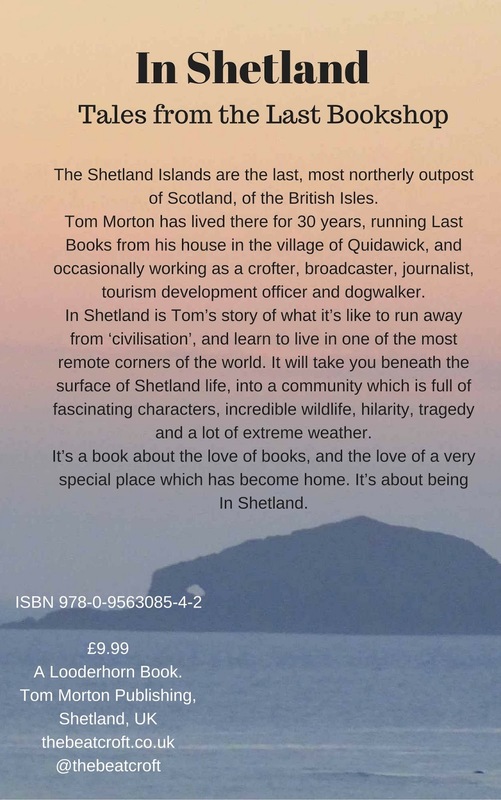 In paper and cardboard, it's available from The Shetland Times Bookshop in Lerwick; You can order it through ANY bookshop quoting the ISBN number (tell them it's distributed by Ingrams). It's cheap online via Lulu, and roughly the same in paperback if you have Amazon Prime, as that includes postage. 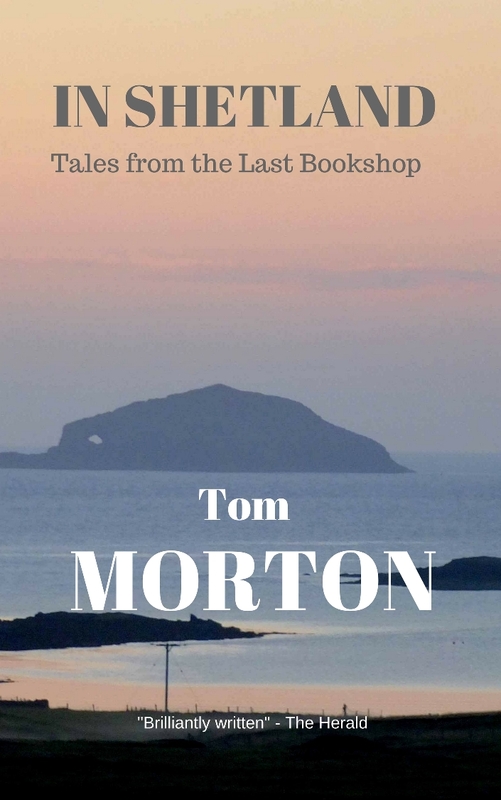 Amazon also have it as a Kindle download and this is REALLY CHEAP - less than a third of the paper price (bit of a Morton obsession, Kindle pricing). The limited edition 'Present from Ramnavine' pack is now SOLD OUT. All orders will be sent out on Tuesday of NEXT WEEK (waiting for delivery of books). If you just want a signed copy, for £9.99 plus postage, go here. Again, waiting for books, so it'll be Tuesday before I can send anything. I'll be delighted to write a dedication to you or someone else if it's a gift. 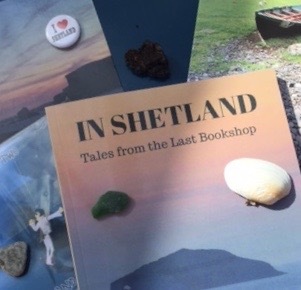 I wanted to make a book about my relationship with Shetland. A love story, really. Truthful, factual, fictional. Tender and brutal, caring and funny and capturing the place, the people, the sheep, goats and boats as best I could. I wanted to delve into 20 years and more of writing about being here, and make something of all those words, tens of thousands of words, some published, some not. And I focussed on the Last Bookshop idea because I did, in fact, run our old croft Gateside as an actual, come-in-and-have-a-coffee second-hand bookshop for a year or so. Have ever since dabbled with selling books and art online, and recently taken the whole thing a bit more seriously (£179, the other day, for a rare whisky book which cost me nothing; more than I've earned from actually writing books for...a long time. I began editing, then rewriting, and writing afresh. 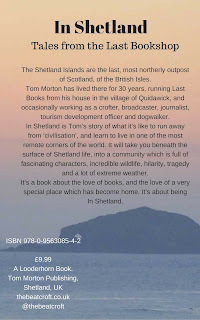 Monthly blogs from Promote Shetland turned into essays, began twisting in my hands into something else. I made some pieces of - let's say art, from beach finds, seaglass, wood, stone. Sold them. I left the BBC, blogged, broadcast locally but also to the world on 60 North Radio/TV, and about Shetland. And I wondered: could I put this together? A blog, a bookshop, a book about a bookshop, broadcasting, the artwork? Be a small, remote, connected self-contained creative unit? Tell some stories, make some noise, make some things to put on people's walls? Sell stuff? I don't like the crowdfunding concept, and sites like Patreon still less. I don't want to beg for support, or ask for help in writing a book, or making music which could, in the end, be rubbish. I particularly dislike the 'tipping' notion that Patreon thrives on. It's like busking, only you're asking people to give you cash on the basis of what you might be like if you only had a chance to work on your act. Truth is, many years ago, in another life as an evangelical 'living by faith' musician, that's what I did. I had a 'prayer letter'. I cultivated support. I begged. (And gigged and made records, it must be said). It felt weird and wrong then. It feels weird and wrong now. When there's no praying for money. Religion aside (and I look back on my Brethren past a little in the book), I've been writing and talking professionally for over 30 years. I believe in what I do. I'd rather make something and offer it for sale. Sure, there's an act of faith (small 'f') involved. The excerpts online or that you leaf through in a shop may not be representative. There's luck. But anyway, I've made this stuff, paid for it. Here it is. If you like, you can weigh up the idea, sample it online and pay me for it, see how you get on. I like the notion of a transaction. For a long time, I was a typewriter for hire. For cash money. Hitting deadlines, wordcounts, timings. Was I any good? Good enough to get paid. Maybe I've written enough. Who knows? Soon find out! At least the stuff is out there. And as far as In Shetland is concerned, I think it contains some of my best writing. What I've decided to do is produce something new about Shetland (pictures, writing, videos, poems) at least weekly here, online, for free. And I'll offer some stuff for sale, too: My writing, art, second-hand books. Check out the side panel for links to my eBay and Etsy shops. 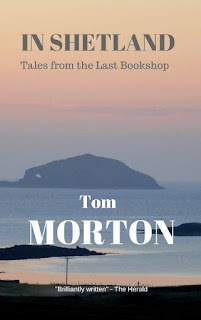 And if you're in Shetland yourself, drop in and browse. At the actual Last Bookshop. Because it does exist. All you have to do is find it. What's it like? Have a read at the first chapter on Amazon. You don't have to own a Kindle or register with Amazon. Just click on 'Look Inside' here. The limited edition 'Present from Ramnavine' pack is now SOLD OUT. All orders will be sent out on Tuesday of NEXT WEEK (waiting for delivery of books). If you just want a signed copy, for £9.99 plus postage, go here. Again, waiting for books, so it'll be Tuesday before I can send anything. I'll be delighted to write a dedication to you or someone else if it's a gift. If you just want a signed copy, for £9.99 plus postage, go here. I'm enjoying the process of being a book maker. I hope you enjoy the end result and maybe some of the associated attachments. I'm betting you will.